One of the oldest and certainly the largest cosmetic ‘mall’ of Pune, Sunshine Beauty Centre, run by the Vaswani family, on MG Road, is your one-stop shop for all your beauty products, across brands and price range. Ever since 1989, Sunshine Beauty Centre has become one of the most trusted names in the city when it comes to cosmetics. 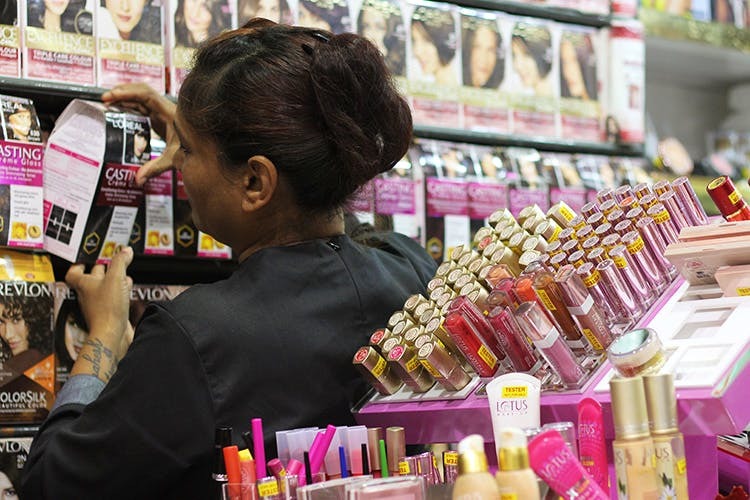 Serving almost 150 customers daily, this store houses more than 1,000 beauty products and essentials under one roof! From shampoos to lipsticks, body wash to sunscreens, nail paints to straighteners, you name it and you get it from Sunshine. Displaying products from high end brands like L’Oreal, Maybelline, Chambor, Revlon, Nivea, Lotus, Lakme, Color Bar, Faces and more, Sunshine adds a new product from a brand each day on its shelf. What more? You’ll never leave empty-handed from this store! Were you looking for a specific shade of lipstick or foundation from a brand but failed to get your hands on? Go to Sunshine and find the product of your choice. The variety out here is so large, that even city-based salon managers drop by to buy the cosmetics. The reason is simple. Sunshine stores beauty products that no one in the city has. Sunshine Beauty Centre has recently launched their line of nail paints displaying 80 shades of funky colours, starting at INR 100. Additionally, if you’re looking for de-tangling brushes or beard combs for your man, check out Sunshine’s in-house collection of combs, starting at INR 280. The store offers some lucrative in-house discounts, over and above the brand rebates, throughout the year. Remember, October is their birthday month and they are planning to go big on their discount this time. Last year, they had flat 10-40% discount on most of their products. For updates, stay tuned to their FB page. Hunting for a quirky green hair color or a mauve lipstick or an organic face cream, but can’t find anywhere in the city? Sunshine Beauty Centre has them all!